Titti and I are mostly going to feature cut flowers here on FLOWERS and how to use them in floral arrangements. But now and then we would also like to show how to use potted plants in creative ways. So this week the theme is primroses. 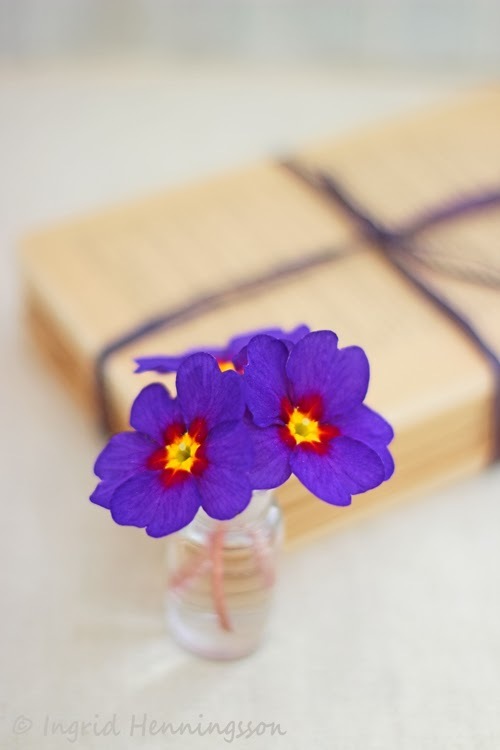 This time of year the shops and flower markets are full of stunningly beautiful primroses. You could buy every colour available and mix them like a bag of colourful floral sweets. Or you could just pick out the colours you like - if sold in individual pots. 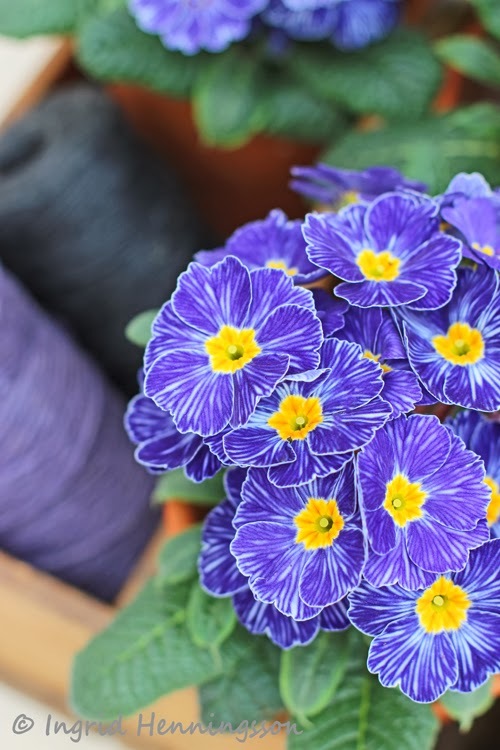 Primroses are often sold in mixed trays at nurseries and garden centres - so sometimes you just can't pick and choose. Primroses are very happy growing in window boxes and pots. So you could start them off in a pot and then plant them out in the garden where they will come back year after year. 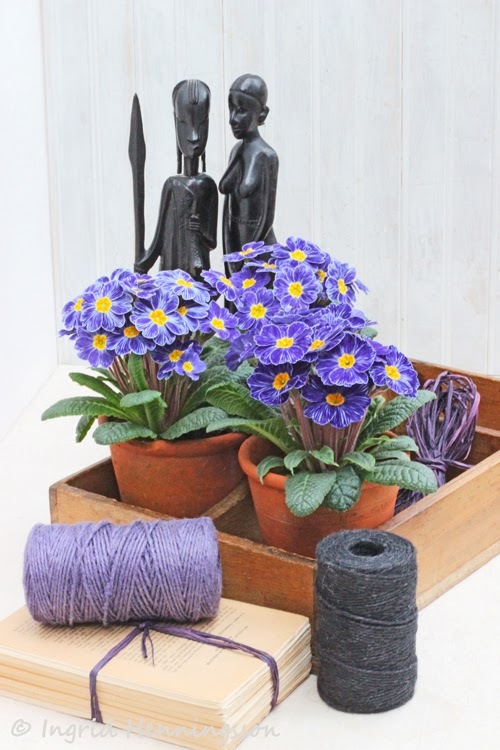 I found these beautiful purple primroses with variegated petals at Clifton Nurseries in London. It's a small nursery worth visiting - you'll find lots of inspiration. As usual they came in the standard plastic pot - but instead of leaving them in the plastic pots and then try to hide them in a larger pot, basket or similar. I decided to re-pot them in some vintage terracotta pots - so you would have the pleasure of looking at a nice pot as well. When you get them home give the plants a good drink of water and then leave them to drain for a while before re-potting them. Once in their new container you'll need to put a little saucer or tray under each pot to collect any water. 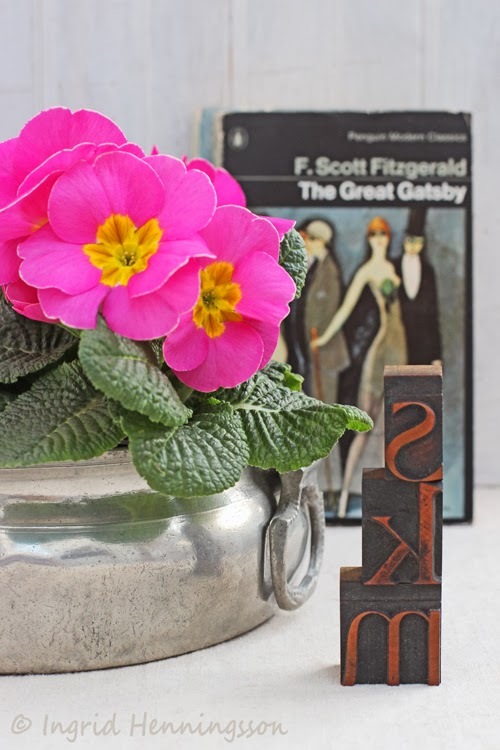 I found these very bright pink primroses a few days later at a favourite flower stall at my local farmers' market. How could a girl pass those up? This time I have kept the primroses in their plastic pots as I intend to plant them all outside in a large pot on the terrace. So just for a short while they had a temporary home in a basket and a pewter container - just to show off their beauty and to be photographed. 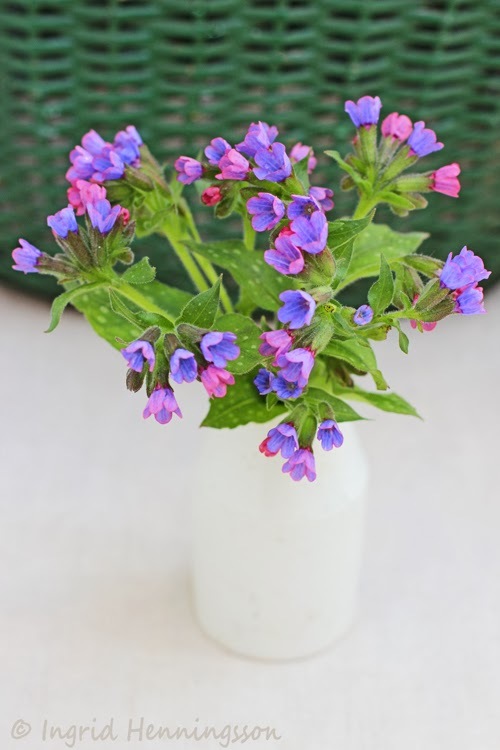 The Pulmonaria are flowering in my garden and I made a little posy using just a few stems in a white vintage vase. Simple and sweet - just remove any leaves under the waterline and as usual cut the stems at an angle. These little beauties will not last for very long so just a flower arrangement for 'the moment'. When Titti and I discussed the theme for this weeks FLOWERS - we both said that you couldn't really use primroses as a cut flower. Well, I wanted to try. And presto you can! Cut the stems as long as you can and put the flowers in tiny little jars or bottles. They look very sweet on a side table or next to each place setting on a dining table. They have lasted quite a few days - mind you I always put my cut flowers in a cool place at night. Please, go over and have look at what 'my partner in crime' Titti on HWIT BLOGG has created this time. Here is a link to our previous FLOWERS by ingrid and titti. Wishing You A Wonderful Floral Day! Vilken härlig färg du hittat på primulan! Som vanligt är du så himla bra på arrangemang och vackra bilder Ingrid! 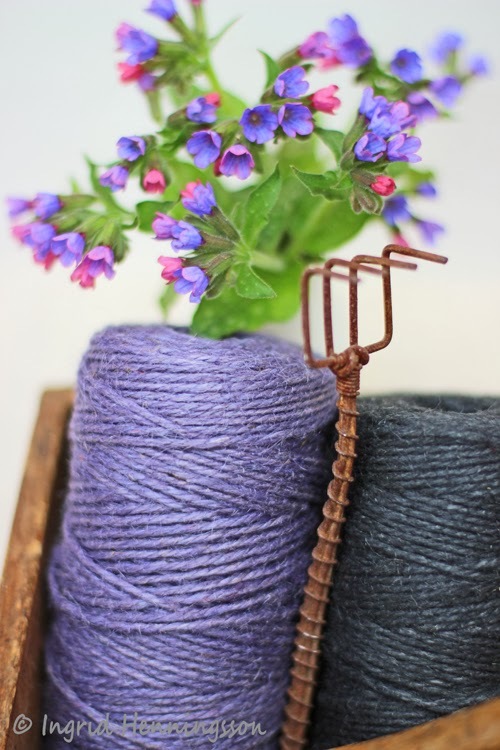 These are just beautiful, Ingrid! I love Primroses, but you know, I have never seen variegated ones, and they are so pretty! As always, I just love the wonderful way you arrange everything. So nice. Åååå for en nydelig blå primula!!!! Skal si du finner masse flott! Här var det mycket att njuuuta av! Både vackert & kreativt! Beautiful blue primroses, but I most love the small bouquet of Pulmonaria. 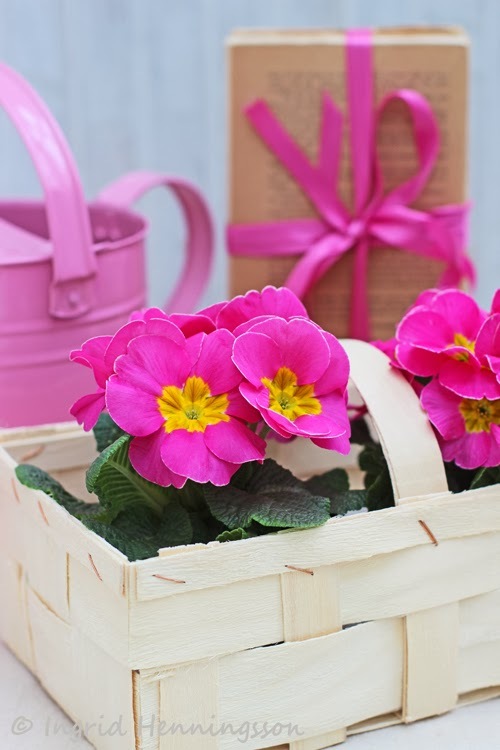 Titti and you have given us a fabulous color feast of primroses! I have never seen a primrose that did not make me smile. 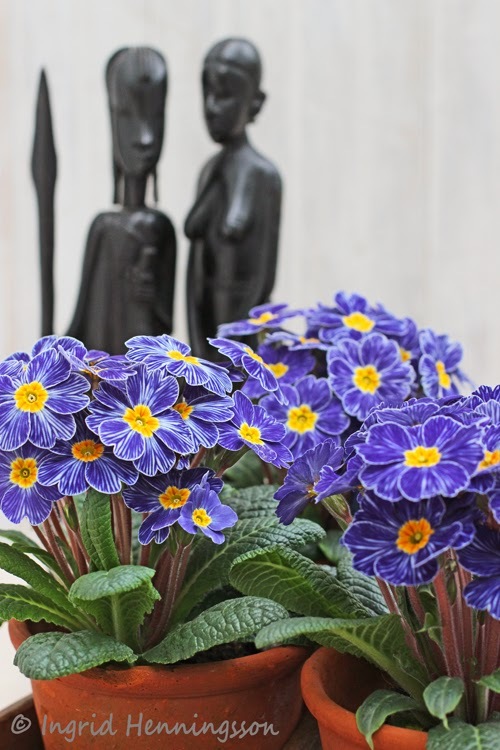 I must bring at least one potted primula into my apartment in the next few days!